What animal is an expert fisherman, can climb trees and enjoys dumpster diving? If you guessed the bear, you’re right. Bears are large, lumbering animals. They walk on all four paws but can rise up on their hind legs. Bears are carnivores, or meat eaters, but most of them eat berries, roots and nuts too. They love human food and dog food and can sniff out snacks. There are eight species of bears – brown bears, American black bears, Asian black bears, giant panda bears, sloth bears, sun bears, spectacled bears and polar bears. Of the eight species, six are threatened with extinction. Most experts think all about bears is that the polar bears are the largest. Koalas are not bears. They are marsupials. The dawn bear was the first bear. It lived more than 10 million years ago. In the north, bears sleep in the winter, but they don’t hibernate. Hibernating animals have a very low temperature. Bears just take a long, long nap. Sometimes they wake up and go out in the winter. Bears are related to walruses, seals and sea lions. Bears can see color. Not all mammals can. Giant Panda are classified as a bear. The giant panda was endangered in the wild but in recent years population has grown slightly and they are now classed as vulnerable. Bears have one of the best senses of smell of any mammal. Much better than humans. A family or group of bears in called a “sloth”. 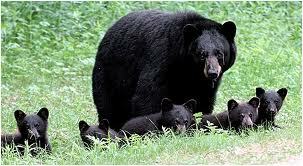 A male bear is a “boar”, females are called “sows” and babies are “cubs”. 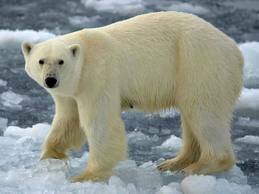 A polar bear might look white, but that that’s because we only see the white fur, underneath the fur the polar bear actually has black skin. The only known predator brave enough to take on a fully grown bear is a tiger. Unfortunately humans also hunt bears. Bears are better swimmers than you or I.
Polar bears are known to be long distant swimmers, they can swim up to 30 miles without stopping. Some researchers say they can actually swim up to 200 miles, yikes. You certainly will not out swim a polar bear. Bear claws are similar to dogs, they cannot retract them unlike a cat who can. A video documentary about the giant bears – their lives and their habitat. Question: According to legend, where did the word “berserk” come from? Answer: Vikings in northern Europe believed that by wearing a shirt made of bear skin, they took on a bear’s behavior and strength. Question: What did Merida’s mum, Queen Elinor, in the movie “Brave” become? Question: What bear is the largest? Answer: Most experts think polar bears are the largest. Males weigh between 900 and 1,500 pounds. Brown bears are the next largest. Question: What is the smallest bear on earth? 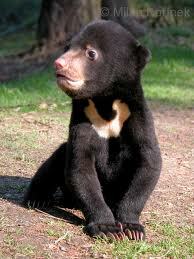 Answer: Malayan sun bears. Male bears weigh between 60 and 110 pounds. That’s the size of a large dog. Know more all about bears here. Declan, Tobin. " Fun Bear Facts for Kids ." Easy Science for Kids, Apr 2019. Web. 24 Apr 2019. < https://easyscienceforkids.com/all-about-bears/ >.